Colby Covington is not happy with his employers, as he was passed over for a Welterweight title shot against Tyron Woodley. Covington would take UFC President Dana White to task on Monday, after it was confirmed that Kamaru Usman and not the former interim welterweight champion would get the shot at UFC 235 on March 2nd. Covington told MMAJunkie that he plans to find White, “get in his face,” about why he was snubbed for the title shot. 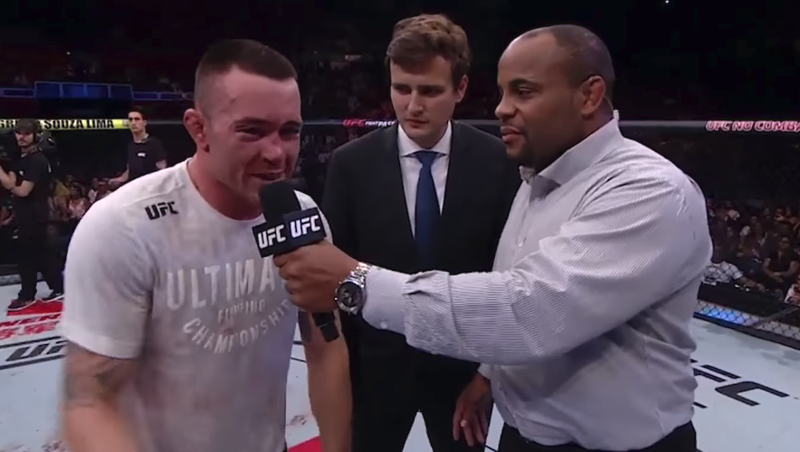 Covington also espoused a conspiracy theory that he’s the victim of a power play between the UFC and Usman’s manager Ali Abdelaziz. When asked of the actual fight, Covington claimed that “Woodley’s going to smoke him,” Covington of Usman’s first title shot. “Usman’s a scrub, and he shouldn’t even be in that position. He hasn’t even beaten anyone in the top 10 coming off a win. His only ranked wins are against guys coming off losses – and guys coming off losses that I already took their souls and left them (expletive) bloody and beaten and they had no will to fight anymore. He’s got a padded record. He shouldn’t even be in the position. “I don’t really have a relationship with Dana White, and I don’t give a (expletive) about him,” Covington told MMAjunkie Radio of the man who got him in the Oval Office to meet President Donald Trump in 2018.